Color(s): Black, gray, apricot, brown, white; may be solid, parti, or sable. The schnoodle came into existent by the crossing of two breeds the Schnauzer and poodle. These types of dog breeds are also known as designer dogs and are very popular crosses. A good Schnoodle should be well, fit and athletic, in expression they have keen, bold and brave expressions and a hard and tough body. This breed of dogs are very loyal and affectionate and brave they are very good with children and older people. Schnoodle do best in homes, they have a sensitive feelings and can became destructive if they are left alone for long periods of time. They are very alert and suspicious of strangers. 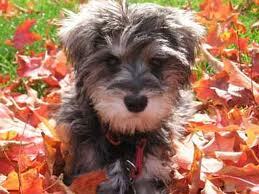 The coat of the Schnoodle may be wiry and coarse, curly, or a combination of both. This breed of dogs requires early socialization and obedience training, training should be given to them with fairness and patience, they will not respond to heavy and hard methods of training. This breed of dogs is very energetic and requires sufficient exercise to remain fit, they will do ok in apartments, they love to go for a long walk and enjoy family play sessions. This breed of dogs need regular brushing to avoid dead hair. Bathing should be done when it is needed. It is important to keep the ears of this breed clean to avoid infections. They may be prone to such health issues as PRA, skin disorders, Von Willebrand's Disease, diabetes, ear infection, epilepsy, and heart disease. The average lifespan of this dog breed is 14 years. Keep your dog in a healthy environment to protect it from dog diseases, if you see any signs or symptoms consult a veterinary for diagnosis and early treatment.